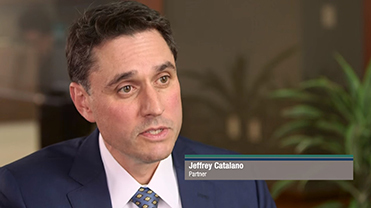 Jeffrey N. Catalano is a partner in the firm. He represents victims of catastrophic injuries in medical negligence, construction accident, auto accident, food poisoning, product liability, and other personal injury cases. On behalf of clients, Mr. Catalano has obtained numerous multi-million dollar results in cases statewide and nationally. He obtained an award of $10 million for a severely disabled child, the highest medical malpractice arbitration award in Massachusetts history. He also had the largest medical malpractice verdict in Massachusetts in 2017 arising out of the death of a mother following the birth of her child. Mr. Catalano has been selected to the Best Lawyers in America directory for medical malpractice, personal injury, and product liability litigation (plaintiffs) for four consecutive years (2015-18), and has been designated as one of Boston's Top Rated Lawyers in Medical Malpractice by the Boston Globe and Wall Street Journal. He has been chosen as a New England Super Lawyer each year since 2009. Mr. Catalano is a Past President of the Massachusetts Bar Association (2016-2017). He serves on various committees that advocate for legal services and access to justice for the poor. Mr. Catalano has spoken on a variety of topics related to trial strategy, medical legal issues, and personal injury matters for the Massachusetts Bar Association, the Massachusetts Academy of Trial Attorneys, local law schools, and on local and national television. Mr. Catalano is frequently quoted in the media and contributes guest articles on a variety of medical malpractice and other personal injury topics. Mr. Catalano is deeply committed to health care safety. He regularly testifies before the Massachusetts Legislature regarding patient rights and health care issues. He volunteers to work with physicians and hospitals as a member of the Massachusetts Alliance for Communication and Resolution Following Medical Injury (MACRMI), which seeks to improve transparency and compensation following medical errors. He is also on the faculty of the Institute of Healthcare Improvement. He has received a "Hero from the Field" award for his work to improve health care quality and patient rights. He is a graduate of Boston College Law School, where he received the Commencement Achievement Award. Martindale-Hubble AV Peer Review Rated signifying the "highest level of professional excellence." American Board of Trial Advocates. Membership is by invitation only to lawyers who are of "high personal character and honorable reputation" and have tried substantial cases. Top 100 Attorneys in Massachusetts, Boston Magazine, 2017. Top 100 Massachusetts Super Lawyers, Personal Injury in Boston Magazine, 2017. Best Lawyers in New England, Boston Globe and Wall Street Journal, 2013-2017. Boston's Top Rated Lawyer in Medical Malpractice, Boston Globe and Wall Street Journal, 2014-2017. New England Super Lawyer in Boston Magazine, 2009-2018. Rising Star, Super Lawyers in Boston Magazine, 2005. President's Award from Massachusetts Academy of Trial Attorneys, May 2013. Hero from the Field Award for work for patient rights, health care, and safety, 2009. Lawyer of the Month by Health Law Advocates, Pro Bono Legal Network for exceptional representation of clients in June 2008. Double-booked surgeries: Are doctors overlooking patient safety? Jeffrey N. Catalano Co-Editor 3rd Ed of MBA "Guide to Judicial Practice in the Superior Court of MA"